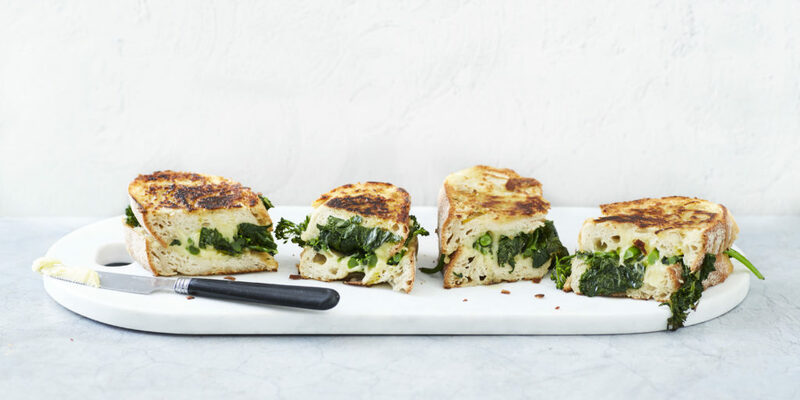 We’ve combined everyone's fave – garlic bread – with a toastie! Genius, right? Throw some crunchy broccolini and a little kale into the mix, and you’re well on your way to your 7–9 serves of veg a day. 1 bunch broccolini, sliced lengthways. 1 cup kale, tough stalks removed, chopped. 30 g grated Cheddar cheese. 30 g grated mozzarella cheese. 1. Add oil to a medium skillet pan over a medium-high heat. Add in the broccolini and kale for cook for a further 4 minutes, or until you can pierce the broccolini with a fork. Season with a little salt and pepper and set aside in a bowl. 2. Combine butter and garlic and spread on one side of the bread slices. Place slices butter side down on the same pan used to cook the veggies. Distribute both cheeses between 2 of the slices, reserving half of the cheese. These will be the bottom slices of your toasties. Top with a layer of the veggie mixture, followed by the remaining cheese. Add the top layer of bread and cook the sandwiches on each side until the cheese melts, about 2 minutes on each side. 3. Slice sandwiches in half to serve. Gluten-Free Option: Use gluten-free bread in place of sourdough. Dairy-Free Option: Use olive oil in place of butter and swap out cheese for ½ an avocado.